The systematic devaluation of S&T and research, and the suffocation of critical thinking in educational institutions and in society at large, will severely hamper the future of the country, especially of its youth in this knowledge era. Earlier this year, the All India Peoples Science Network (AIPSN) called for observing August 20 as National Scientific Temper Day (NSTD), in order to commemorate the cold-blooded murder of Dr. Narendra Dabholkar, well known campaigner against superstition and for scientific temper, on that day in 2013. To the horror of the nation, the original suspicion was confirmed by the very similar murders over the next three years of Govind Pansare, Prof.M.M. Kalburgi and journalist Gauri Lankesh. Investigations by Central and State police agencies were making little progress, due either to incompetence or to deliberate laxity, although the slow trickle of what little evidence was coming in, increasingly pointed to inter-twined Hindutva extremist, indeed terrorist, outfits. In parallel, an evidence-based approach to rational discussion of issues continues to be under severe attack by Hindutva extremist outfits in institutions of higher learning, in cultural spheres, in public discourse and on the streets, where perception is touted as more important than fact, and where “alternative facts” can be freely concocted and propagated so as to conform to preconceived opinions which only need faith as proof. Indeed, science itself has been pooh-poohed by leading lights of the ruling dispensation and its allied forces outside government who manufacture patently absurd accounts of ancient Indian achievements in science In light of these developments, AIPSN’s call was quickly joined in by numerous organisations all over India dedicated to promotion of a scientific outlook and evidence-based reasoning. This year, the call to observe National Scientific Temper Day issued jointly by AIPSN and the Maharashtra Andhashraddha Nirmoolan Samity (or Maharashtra Committee against Blind Faith)- the organization founded by Dr. Dabholkar - was endorsed by numerous scientists, intellectuals and organisations. Rallies, hall meetings, popular lectures, science experiments in schools, screening of lectures by Dr. Dabholkar including dubbed translations in many languages, and other activities were held in over 250 locations across India. These multifarious activities were all directed at the common goal of promoting scientific temper and critical thinking as part of the broader effort to combat the forces of darkness, unreason and blind faith. In the media and in general public discourse, all the four victims named above have been described as “rationalists,” which does not really capture their work or outlook. All of them were rigorous thinkers and activists who had based their opinions and passionate advocacy on careful accumulation of evidence and well reasoned conclusions which, in many ways, challenged several foundational ideologies of the hydra-headed Hindutva brigade and roused their murderous wrath. Narendra Dabholkar’s writings, public lectures and training given to youth who worked with him underline the importance he gave to evidence-based reasoning and to non-acceptance of received wisdom regardless of who it came from. His seminal contribution, the Anti-Superstition Bill which he drafted and ardently campaigned for till it was adopted by the Maharashtra Assembly, focused not on silly everyday superstitions such as black cats crossing one’s path, but on so-called black magic, fake remedies for ailments and health problems, human sacrifices and similar rituals, and other such harmful practices which exploit gullible people and prey on their ignorance, superstitious beliefs and lack of access to social services. Many vested interests, so-called godmen and peddlers of fake remedies who had made an industry preying on simple people, were seriously upset and lobbied hard against Dr. Dabholkar and the Bill. Many groups are now campaigning in different States to pass similar legislation, and the Cabinet of the previous government in Karnataka had adopted a draft which now awaits passage in the Assembly. Govind Pansare, activist of the CPI, had worked to support inter-caste marriages and delivered lectures on the true legacy of Shivaji, whom he considered a leader of the backward communities. He also campaigned vigorously against efforts in Maharashtra to glorify Gandhiji’s assassins. Incidentally, Govind Pansare had also called for a ban on the Sanatan Sanstha extremist outfit which, it has now come to light, was allegedly involved in some or all the four murders discussed here. 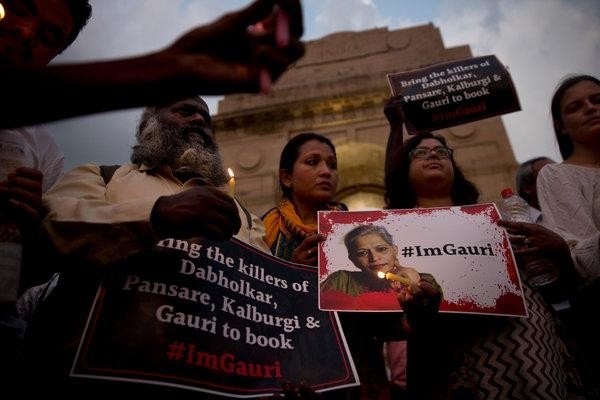 Gauri Lankesh was a fearless journalist and fierce critic of communalism and Hindutva bigotry. A common thread tying all four murders together is clearly the fact that extremist Hindutva forces felt threatened by the power and influence of these campaigners, especially their unassailable marshalling of evidence and reasoned arguments in support of their specific positions as well as against bigotry, communal hatred, the casteist status quo, and for diversity, pluralism and critical thinking. Their murders, regarding which threats had been frequently made by these groups or by supporting trolls, were meant to send a message that Hindutva extremism does not tolerate reasoned debate or being questioned, the very essence of a scientific temper, but demands total acceptance of their views, however false or incorrect, at pain of death if so decided. Within science itself, too, the very methods of scientific inquiry and the history of how science grew as a coherent, universally applicable body of knowledge have been subjected to ridicule by Hindutva forces. An imaginary golden past of “Vedic science” is being propagated. Real and great achievements in science and technology, and rich traditions of rational thought, emanating from the Indian sub-continent are being sidelined and demeaned by the obviously fake achievements in ancient (read Hindu) India being proclaimed by top-level Central and State Ministers, Chief Ministers and political functionaries, substituting mythology for history, including from the pulpits of the Indian Science Congress, much to the shame of gathered Indian scientists and the amazement of international scholars. For instance, claims that the Ganesh deity having en elephant’s head on a human body was proof of existence of plastic surgery, or that ancient India had knowledge of in vitro fertilization. Or that aviation and space technology for inter-planetary travel existed an astonishing 8000 years ago! If the Prime Minister had remembered that, he might have saved India a lot of money when he announced sanctioning of funds for human space launch on Independence Day! The Chief minister of Tripura has repeatedly claimed that the internet existed in India at the time of the Mahabharata, and so on, and all before recorded human history. Many other fantastic claims have been made by some state and central leaders, such as that the theory of evolution is wrong and that the Vedas contained theories “better than” Einstein’s E=mc2! In sharp contrast, real and important contributions to science and technology in India emanating from not just the Vedic-Brahmanic tradition but from many different strands of culture in the sub-continent, such as the Jaina, Buddhist or Islamic traditions, or from peasant, adivasi, or other working people, are ignored. Contributions of artisanal communities in India, who were actively involved in the development of crafts, technologies and productive forces, are also ignored, revealing persistent social blind-spots and prejudices. Further, many other civilizations too have made important, even seminal contributions to the growing body of what we today call science. India both drew from, and contributed to, many of these contributions by other civilizations. Understanding and highlighting the many real contributions from India to the universal body of science and technology is tribute enough to India’s civilizational past, without having to invent any. Efforts to question or disprove such views are attacked, not by resorting to any rigorous historical or other evidence, but by demanding that such claims simply be accepted as true either because they are written in ancient Sanskrit mythological texts or just because these leaders have said so. Surely, such fantastic achievements would have left some trail of supporting evidence, such as some descriptive texts demonstrating existence of supporting or related knowledge, archaeological evidence of materials or artifacts etc. But no! Scientists, scholars and others from India and abroad, including Nobel Laureates, who have expressed their disagreement with such views, have been attacked as anti-national, western-oriented, and “sons of Macaulay”. Pseudo-histories and anti-scientific views are being incorporated into school curricula and college or university teaching. This assault is not restricted to the natural sciences only, but extends to the social sciences as well. Clearly false claims are being made about Indian history, demography, social and cultural practices. Everybody will remember the claims that the Babri Masjid stood at the very spot where Lord Rama was supposedly born and no amount of historical or archaeological evidence would suffice to trump the “faith” based belief in favour of that theory. Channels are being dug up and water pumped into them to “prove” that the legendary river Saraswati flowed through that region! And claims aimed at communal polarisation, such as that minority groups would soon become more numerous than the majority community are repeated ad nauseam despite being disproved by data from each Census. Whatever be the differences in methodology between individual disciplines, and between the natural and the social sciences, they all work on evidence-based reasoning and a spirit of inquiry, a scientific temper. But today, universities and research institutions have become arenas of constant assault, often literally, on intellectual autonomy and critical thinking. So-called “research” to “prove” pseudo-scientific claims in both the sciences and the social sciences are being officially funded by government. Benefits of cow products are being investigated by scientific departments. Lists of social science research topics have been drawn up to establish positive outcomes of governmental programmes. And IIMs are being funded to develop “Indian” systems of management! The aggressive anti-science and anti-rational atmosphere whipped up by obscurantist forces with official support, and the climate of intimidation that accompanies it, is casting a long shadow over our educational and research institutions. Developmental programmes are being formulated without significant S&T or other research inputs. Mega projects like the Bullet Train, Smart Cities, Make in India etc., are being undertaken with no scientific inputs, at least in the public domain. Development policies in industry and agriculture, in key infrastructure areas like energy, coal, oil and gas, power, transport and for basic needs like food, water and health are being driven by corporate interests with little concern for the poor or for the common citizen and without any public scientific or other evidence-based reasoned debate. Environmental concerns are being systematically sidelined. This systematic devaluation of S&T and research, and the suffocation of critical thinking in educational institutions and in society at large, will severely hamper the future of the country, especially of its youth in this knowledge era.